Getting a professional pedicure might seem like a basic service that clients enjoy from time to time, when in fact, it can be the ultimate relaxation experience. That is, of course, if a nail salon is equipped with one of the best pedicure chairs. Technology has evolved considerably and is being integrated in all fields of activity. Beauty and cosmetics are no exceptions, which is why you might want to consider taking advantage of all those benefits. Pedicure chairs have been taken to a whole new level. They are considered to be quite an investment, which is why it is understandable if you think twice before buying one. However, these products deserve their prices and are worth your investment. 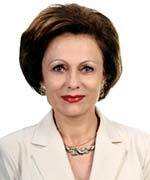 They integrate technologies that contribute to any client’s full relaxation. Actually, they are more than simple pedicure chairs and have grown to be massage chairs with vibration functions, reclining motions and even heating. Some of them require plumbing jobs, some don’t. A pedicure chair is a piece of furniture that will add value to your salon, as it will make an impression and will increase the level of quality of your services. Modern such products have integrated deep footsie baths, a lot of adjustable settings and a stylish design. Also, they are usually ergonomic and make it easy for the pedicurist to work. If you are looking to add new furniture that will bring more clients, you should really check out the five products below. We have selected five of the best-selling products on the market and highlighted their pros and cons. Take a good look at each and every one of them and choose the best option for your needs and budget. 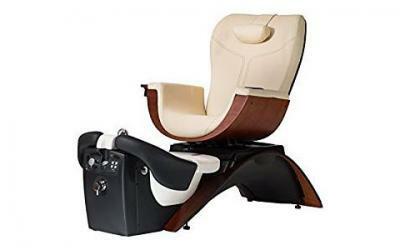 Pibbs’ PS93 model has a lot of great features and it is proudly stands at the top of the list when it comes to low cost pedicure chair options. Although its design and the comfort level that it offers makes you think that it is an expensive piece of furniture, it actually enters the affordable category of products. Even so, it has a lot of powerful characteristics that will probably draw your attention if you are thinking about opening your own beauty salon. This chair measures 33 x 32 x 35 inches and weighs approximately 125 pounds. It is a small sized chair with a nice design, not very sophisticated, yet classy. When installing it, no plumbing is required, as it doesn’t have to be connected to a water supply system. It has a deep footsie bath, double heating and a vibration system that will contribute to your clients’ relaxation. This pedicure chair has six vibration functions, as well as swivel and reclining motions. More than that, it comes with a disposable liner system that eliminates the need to clean or sanitize the bath. It comes in parts, but it is easy to assemble. The chair has a small built-in storage where you can place your tools and accessories, which can prove to be very useful. It also comes with an adjustable footrest, armrests, a cup holder and a remote control. However, it does not include another chair for the pedicurist and the manufacturer doesn’t give any details regarding its weight capacity. Another pedicure chair that is perfect for a nail spa is this model from LCL Beauty, which is both affordable and extremely comfortable. It has a basic design, yet it is perfect for a start-up. It has everything that you need to make your clients feel comfortable. It has a hydraulic mechanism that gives the chair the adjustability you need, it comes with a matching technician stool and an electric foot bath. By comparison to other similar products, this pedicure chair has a portable foot bath with bubbling and heating functions. The great thing about it is that it can be used even without water, so that you can give your clients or yourself a perfect foot massage. Design-wise, the chair has crosshatch stitching that makes it look nice and elegant. More than that, you will be surprised to see that the foot bath is made of sturdy plastic that has 100 nodes that help with sole aches and that relieve tension. Also, it has an internal heating element that ensures that the water will cool down slowly and that the temperature will not drop suddenly. A large massage ball is position at the center of the bath with the purpose of relaxing sore muscles. There are more than one operation modes, so you will be able to adjust it as you desire. The only downsides of this pedicure chair are that it has a foot bath cord and that it is quite noisy during operation. 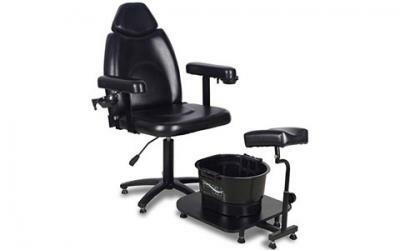 If you own a beauty salon and you are ready to invest in an advanced pedicure spa chair that will give your clients the ultimate relaxation experience, then this piece of furniture is everything that you wished for. It has an incredible design, with a curved chair that distinguishes itself from any other similar product on the market. It has a steel frame construction that is highly durable and has extra support on its base, chair and basin. It was manufactured with great attention to details, from high-quality materials such as leather and wood. It has dual seat controls that can be accessed by both the technician and the client. The chair has a four-way seat movement that can be changed easily, with one touch of a button. The foot bath is covered in a solid surface, chemical and crack resistant. It has a 5.5 gallon capacity and has comfortable leg supports. It has a massage function that works with the help of a pipe-less magnetic jet system. This way, all pedicures take place using a sanitized bath. The seat also has a massage function that is based on a vibration system. It has a heating system on top of this set of features. There’s more to it: it has full side panels, manicure trays and an upholstery that can be customized for each client. This pedicure chair is large-sized and quite heavy, yet it is the best addition for a luxury beauty salon. If you have high standards and you would like to choose a chair that meets your requirements, then this is exactly what you need. If an expensive pedicure chair is not exactly what you are looking for, then we have a great option for you. This product from Icarus is as cheap as it can get, it has a nice, vintage design that looks good in any salon and comes with great features. It has PVC vinyl upholstery and it is highly adjustable. Except for being able to give your clients relaxing pedicures, you can also use the chair for manicures thanks to the comfortable armrests and manicure bowls. This chair is covered in black faux leather, has a classic design, yet its height is adjustable. It has two armrests and an adjustable footrest, as well as a table for the footrest. The chair has a removable head rest, which is great, as not everyone feels comfortable using it. The weight capacity of the chair is 275 Ibs. Although this is a great products that anyone could afford, it lacks the foot bath, which means that you need to invest in it separately. Also, it is not a lightweight chair and it could be difficult to move around, although it comes with wheels. It measures 41 x 18.5 x 52 inches and 20.5 inches arm to arm. This product offers value for money, although it doesn’t include all the advanced features that other more expensive products. Yet another Pibbs pedicure chair is brought to the market, with an American design, great features and an affordable price. The PS89 model is similar to the previous one, being a practical and stylish product, with a comfortable leather seat, a remote control that can help you change the six operation modes, as well as the foot bath’s programs. This is a product that does not come fully assembled, yet it is easy to install and does not need to be connected to a water supply. It has a wooden foot bath table and an integrated footrest that is adjustable. The chair has a reclining function, as well as a vibrating massage function, which will give your client enough options to feel comfortable and relaxed. This pedicure chair’s foot bath is portable and can be used inside the pedicure chair or outside of it. Another advantage of this pedicure chair is that it has a hidden storage space, where you can store all your manicure and pedicure accessories. Besides reclining, the chair also swivels, which makes it easy for you to perform a manicure, too. The PS89 pedicure chair weighs 125 pounds. 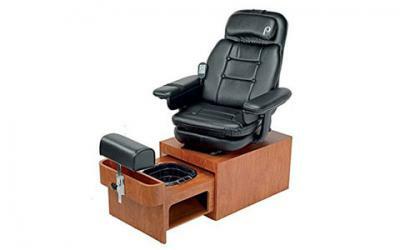 This product is a great option if you have a small to medium space available and if you are looking for a pedicure chair that offers great features for a reasonable price. Also, you will be glad to know that it is covered by a 1-year warranty. There are many reasons why investing in a new pedicure chair is a good idea. First of all, you invest in the comfort of your clients who will keep coming back once they experience the ultimate relaxation. Second, you will improve the design of your beauty salon considerably and will feel better when going to work. Last, but not least, you should take into consideration that new technologies bring a lot of new benefits and they will bring you larger returns on investment. Also, newer products work better, increase the quality of your services and encourage your clients to visit more often. Choosing the best pedicure chair for your business isn’t easy, giving the many options that the market has to offer. 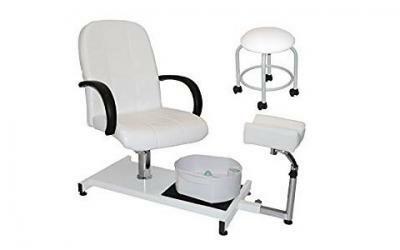 We have included luxury and basic products in our list, in order to offer you a wide view over the most popular pedicure spa chairs today, but in the end it all comes down to the budget. Analyze the pros and cons of the above products and choose whichever meets all your requirements. How to choose the Best Pedicure Chairs of the market?